Cats have one unbelievable quality that they can hide their symptom of getting sick. Thus, the pet owner mostly can’t recognize whether their cat is healthy or not. But, one is suggested to pay attention to the minor changes in the behavior of their cats so that they can prevent it from getting a major health issue. If you really love your cats, you would never like to see your cats getting unhealthy. Below are some signs that can help you to determine whether your cat is healthy or having serious health hazard. Vomiting in cats is the uncommon situation. In case, your cat is doing vomiting, it may be caused by hairballs, diet poisons, constipation, cancer, obstructions, diabetes, parasites or other diseases. Strictly notice, if there is blood in vomit, it is always a sign of serious problem. When your cat has lost appetite, it could be a dental issue or organ failure etc. If you notice that your dog has no interest in eating for the last 24-36 hours then take it to the vet immediately. A cat that obese can have cancer, heart disease, arthritis, high blood pressure, etc. On the other hand, the instant weight loss can also lead them to a serious health problem. Is your cat straining to urinate immediately and out of litter box? If yes, it could be a life threating blockage. If they are not able to defecate, it could be constipation. Blood in the urine indicates for the infection in the bladder. Sometimes, the blood in the stool could appear in black color. So, clearly check it and stay ready for your pet checkup. When your cat suddenly starts meowing unusually or in a different sound, probably, they will be in pain. It is a sign of hyperthyroidism. Finally, when you notice the above-mentioned changes in your cat behavior, take it to Bloor-Kipling Animal Clinic. 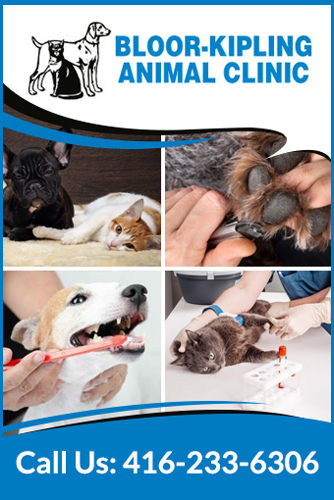 We provide Safe animal health care services in Etobicoke.